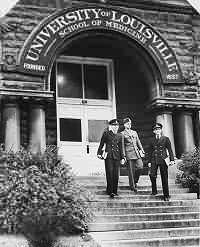 The University of Louisville has had a formal residency program in neurosurgery for more than 50 years. The practice of neurosurgery in Louisville began in July of 1925, when R. Glen Spurling joined the university as a surgical resident. Although Spurling began practice as a general surgeon, he soon became intrigued with neurosurgery and his practice became heavily weighted toward surgery of the brain and spine. Spurling established a neurosurgical service at the University of Louisville while serving as Chief Resident. Subsequently, he was instrumental in founding the Harvey Cushing Society (later the American Association of Neurological Surgery) in 1932, serving as its president from 1934-35. He also published three classic neurosurgical textbooks for students and residents, including standard texts on the neurological examination, as well as monographs on lumbar and cervical spine disorders. In 1939, Spurling helped create the American Board of Neurological Surgery. Notable fellows who studied under Spurling included Frank Mayfield, founder of the Mayfield Neurological Institute in Cincinnati, Eldon Foltz, Keith Bradford and Everett Grantham, the latter who remained in Louisville and joined Spurling as a partner in 1941. During World War II, Spurling was appointed Assistant Chief of Surgery at Walter Reed Hospital, where he built a highly visible neurosurgery unit with close ties to the Surgeon General's Department. 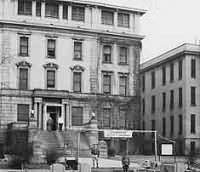 During his tenure at Walter Reed, Spurling's successful operations and scholarly work in the areas of disk surgery and peripheral nerve injuries resulted in those operations being performed by neurosurgeons in the armed forces and VA hospitals well into the 1950s. In 1944, Spurling was posted to London as the neurosurgical consultant to the army, the position held by Harvey Cushing during WWI. On his way home to Louisville in 1945, he was summoned back to Europe to attend to General George Patton, Jr., following the auto accident that was to take the General’s life. Spurling remained active in the army as Senior Neurosurgical Consultant for the VA system from 1946 to 1953. In collaboration with Whitcomb, Woodhall, Mayfield and Grantham, he compiled a two-volume summary of the history of neurosurgery during World War II and continued his prolific research and publishing activity until his retirement in 1961. From 1961 to 1972 our neurosurgical program was directed by Grantham and Ludwig Segerberg. In 1972, Henry Garretson, who had a major expertise in cerebrovascular disease and epilepsy was recruited from the Montreal Neurological Institute to join them. The Division of Neurological Surgery became the Department of Neurological Surgery in 1994. Since then, the department has built an impressive track record in research and clinical care. We have created an outstanding record of research, particularly in the area of spinal cord injury. Funds from endowments provide ongoing financial support for research. 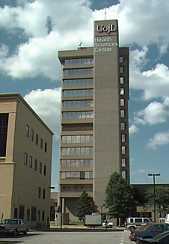 The department is the home of the Kentucky Spinal Cord Injury Research Center. All faculty members holding endowed chairs have obtained NIH funding. Funding for these endowments has been obtained from Norton Healthcare, the University of Louisville, the state sponsored Bucks for Brains Program, the Kentucky Spinal Cord and Head Injury Research Trust, and Frazier Rehab Institute.